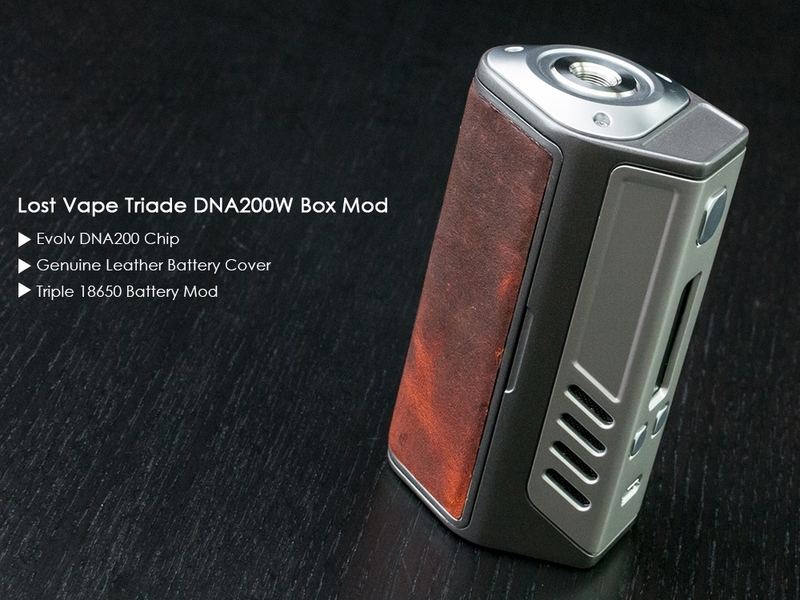 The Lost Vape Triade DNA 200 Box Mod is the first triple 18650 (batteries sold separately) platform from one of the leaders of DNA integrated systems, combining an ergonomic shape with a die cast zinc alloy chassis, oversized control buttons, and a beautiful and comfortable genuine leather paneled door. Designed in the United States of America, the Triade features a triple 18650 battery driven design that allows one of the most readily available and popular battery sizes to be used with Evolv's flagship DNA 200 chip set. The battery door features a leather inlay that adds a distinct look as well as a comfortable feel during use, working in conjunction with the Triade's ergonomic shape. The battery door is secured via two magnets located at the top of the battery bay and battery door, while the battery bay features gold plated contacts with spring loaded negatives for proper battery fitment. The three 18650 battery platform gives it the combination of range and flexibility rarely seen in DNA 200 devices, making the Triade one of the longest lasting and convenient platforms to use. 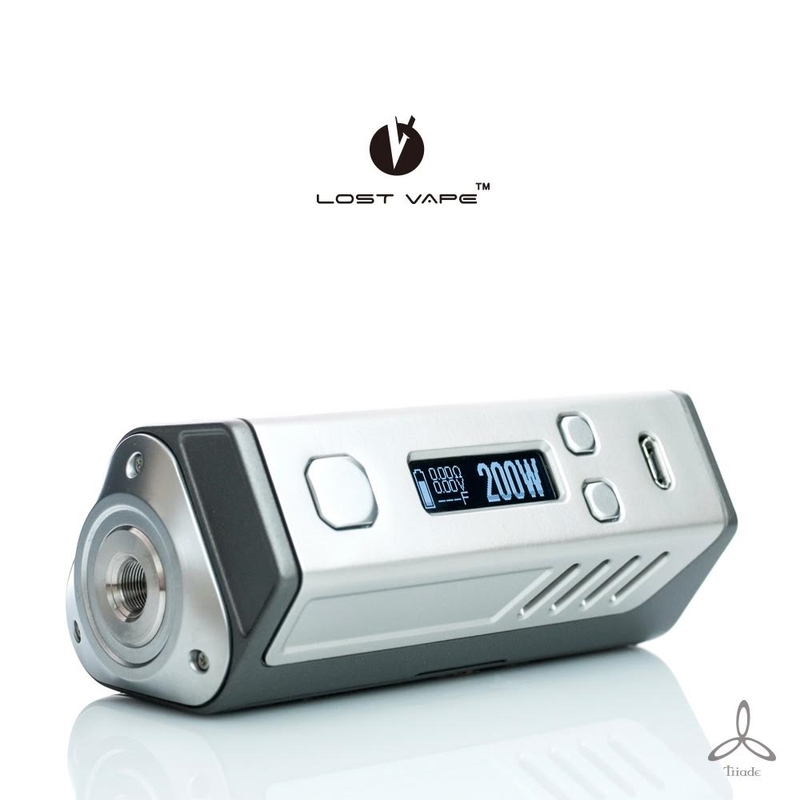 The Evolv DNA 200 remains as one of the most technologically advanced and customizable platforms in vaping output technology, featuring a staggering 200W maximum output, 97% efficiency, full temperature regulation, and customizable screens and settings. The accompanying Escribe software features 93 tweakable settings along with a full array of customizable profiles to finely tune output as needed. Building upon the critical acclaim of the EFusion platform, the Lost Vape Triade Triple 18650 DNA 200 Box Mod is one of the most beautiful and functional DNA 200 devices available on the market today. Please refer to Escribe documentation for walkthroughs and information on how to utilize Escribe.